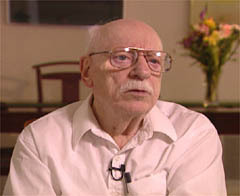 Joe Rosenthal, the Associated Press photographer who gave us the now iconic image of five Marines and a Navy corpsman raising the American flag on Iwo Jima in World War II, died Sunday. He was 94. Ironically, the photograph -- arguably one of the most famous images to come out of World War II -- was taken by a man who was rejected for military service because of poor eyesight. 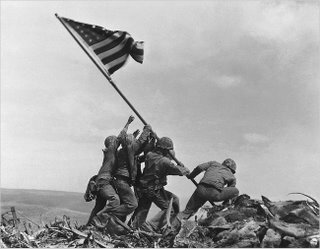 His photograph of the flag-raising atop Mount Suribachi on Feb. 23, 1945, may be the most widely reproduced photo in American history. It was recreated on at least 3.5 million Treasury Department posters publicizing a war-bond campaign. It was engraved on 3-cent Marine Corps commemorative stamps that broke Post Office sales records for first-day cancellations in 1945. It was reproduced as a 100-ton Marine Corps War Memorial bronze sculpture near Arlington National Cemetery. And it brought Mr. Rosenthal a Pulitzer Prize. Since the day the photo was taken, there has been a controversy that Rosenthal staged the shot. He spent his life denying this. In fact, other photographers at the scene when Rosenthal snapped the photo back up his claim that it was not a staged photo. There also is film of the flag raising showing it being erected in one uninterrupted motion. Some have noted that if the photo was staged, the flag-raisers would be looking at the camera. None of them are facing the camera in the shot. To get that flag up there, America’s fighting men had to die on that island and on other islands and off the shores and in the air,” Mr. Rosenthal wrote. “What difference does it make who took the picture? I took it, but the Marines took Iwo Jima. Durst Phototechnik AG, which produced photographic equipment in Italy, said it stopped manufacturing its enlargers as of yesterday, July 31. The company, which produced enlargers for the past 70 years, said sales have been dropping off since 1982. The company's production and sales peaked in 1979 at 107,000 units. The proliferation of minilabs and the services provided by the imaging sector sounded the death knell for its enlargers, Durst said in a statement. 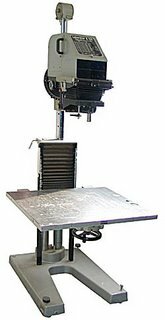 During those 70 years over 500 patents for enlargers were filed, including for groundbreaking features such as the dichroic filter, the electronic integration of light measurement and colour calibration, the closed-loop system, etc. So on 31st July 2006, after 70 years, we will cease production of enlargers, as for years now annual sales have been minimal, running at below four figures. Parts will continue to be available through the company's web site, Durst said.